There seems to be a war on the pulpit and if nothing is immediately done, no one knows what it might degenerate into. Or how would one describe two men of God lurking horns over who is more popular or not? Few weeks ago, a popular Lagos-based soft-sell magazine published an interview granted a man of God, Pastor Anene Nwachukwu of Rhema Deliverance Mission, where he stated that Prophet Chris Okafor of Liberation City in Lagos imitated him, and termed him as 'his boy', who he knows very well. However, Okafor has denied ever knowing Anene and has vowed to give him N5 million if he (Anene) can prove to the world that they met before. Reacting to Anene's claim through his publicist, Okafor said there is no iota of truth in what Anene said. 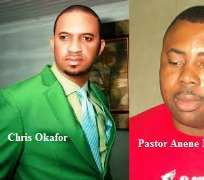 “Dr Chris Okafor had not at anytime met with this pastor,” the publicist, Sunday Adeyemi, said in a statement made available to First Weekly.